Not only NetEnt released a new online slot game today, also Yggrdasil Gaming. 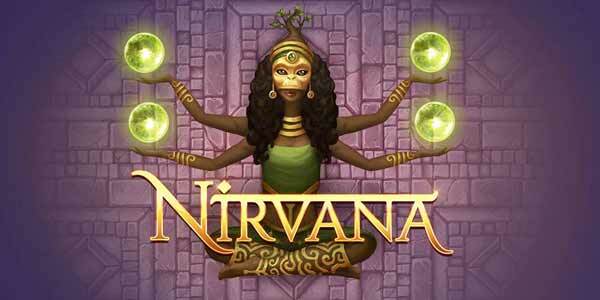 The new slot game is called Nirvana and is also a pretty nice game. Nirvana uses 20 paylines, wild symbols and free spins symbols on all reels. And the game comes with a very unique bonus. There are a total of three different bonus features. Random wilds, Mega Reels and Nudges. If you get 2 free spins symbols you will be awarded with one free spins with one of three random features. But if you get 3 or more free spins symbols you are awarded with 10 free spins and can pick your added feature. Getting 3 or more free spins symbols during free spins will restart the free spins at 10 and you get to add another feature. You can get all three features at the same time. Picking your starting feature is also important. The Wild Seeds feature will award the most wins, the Mega Reels feature will award the biggest wins, but of course less often and the Nudge Feature awards the biggest re-trigger chance. I personally would always start with the nudge feature and hope the game will retrigger. Second would be the Wild Seeds feature for me and last the Mega Reels feature. I think that this way you have the best chance to trigger all three features at once. The game looks amazing and I loved playing it. Nirvana is now available at several NetEnt casinos, including Vera & John.